A long overdue sponsored post. OOTD means Outfit of the Day and I'm excited to show you all my first share of one. Grace of @BELLELAVIE_PH on Instagram has been very generous to send me this fabulous set of outfits from their Dainty Collection. Top is made of black chiffon material. High-waisted shorts made of lacy floral fabric. I love how this fashion gives comfort too. Very light and easy to wear. Shoes from Charles & Keith (not sponsored). Fish-tailed locks by yours truly. I'm a sucker for small details and this top is sick. Look at those punched sleeves and the cut-out collar! I sure will wear this versatile garment again, either for a corporate engagement or a friendly walk in the park. 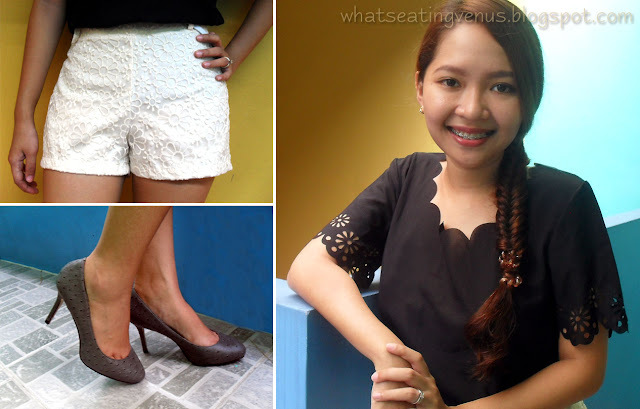 The shorts can be sported in a party or a casual movie date with the hubby. Either way it will give me a prime look! I love how the items contrast in color. I'm crazy about contrast. It's basically been my comfort zone and the number 1 rule I make sure to follow when dressing up. Yes, I'm conservative and safe like that. Visit @BELLELAVIE_PH on IG now and enjoy their wide collection of fashionable shoes, bags, and dresses for reasonable prices! Photos taken by the bff Christian. love, love, love the shorts! you don't have to be nervous next time you do an OOTD. great pose and post!